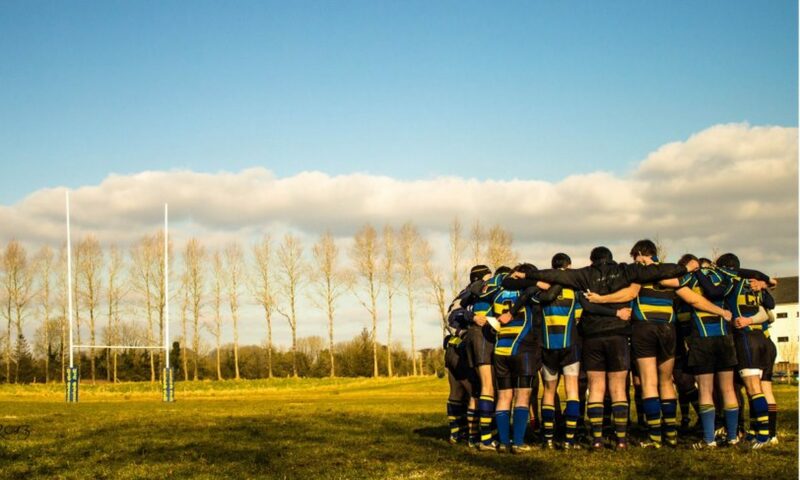 Midland Warriors RFC have won promotion to Division 2b of the Leinster league. The Moate based team defeated Ardee Rfc in a winner takes all promotion playoff match on a score line of 26 -17. 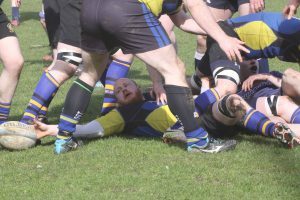 The match was played in perfect conditions in Swords Rfc on Sunday last and the midlander’s took full advantage of the elements and raced into a 14 points lead. A superb break in the first minute by fullback Liam Fitzpatrick led to the Castledaly man offloading to the supporting Dusan Vucicevic who powered through under the posts giving Ernie Buckley the simplest of conversions. Five minutes later, following a good line out win by Cathal Connell and the rampant Montenegrin international Dusan Vucicevic was on the charge again, this time he made the break himself, and despite being stopped short of the line, a deft offload to the ever supporting open side flanker Daniel Buckley led to another try under the posts. Mount Temple native Ernie Buckley made no mistake with the conversation making it a perfect start for the Warriors, 14-0. 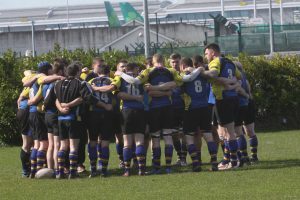 However, Ardee who have spent the whole season playing a division higher than the Warriors in Division 2b were by no means going to lie down, they started to throw the ball around more and their fullback almost made a break through on the half hour mark, only a last gasp tackle from Keith McKiernan denied him a score. A yellow card for Vucicevic, following a high tackle, further deepened the pressure on the Moate men, but some astute defending from the likes of Adam Daly, Mark Coleman, Tony Collins and Jonathan Whatley just about kept the Louth men scoreless. With the sin bin time up and Dusan back on the pitch the Warriors scored a vital try just before the half time break, good carries from John Seery and Dylan Lynch opened up space for scrum half Paul Dunican to put player/coach Keith Sothern in for a try with a defence splitting pass. Buckley once again added the conversion, 21-0 to the Warriors at the break, but the scoreline was harsh on Ardee, who were far from done in this game. The second half started with concerted pressure from the Louth men, which did eventually lead to them finding a kink in the Warriors defence, their ever dangerous left winger getting in under the posts after a well worked move, they also converted the try, leaving the game 21-7. From the kick off Ardee were on the front foot again and when Warriors captain Eddie Egan received a yellow card for some overzealous rucking, the pressure was well and truly on. Wave after wave of Ardee attacks were repelled while the Warriors were a man short, with some big hits going in, Nigel So and Darren McCormack were introduced to add some fresh legs and both were involved in some excellent tackling to stop Ardee short of the line. A brilliant turnover on the deck by Warriors open side Daniel Buckley eventually led to full back Liam Fitzpatrick being able to clear the midlander’s lines and as Mount Temple man Egan returned to the fray the Warriors were back to fifteen men and confidence grew. The decisive score of the game came just at this point, another good turnover by Daniel Buckley led to the ball making it’s way as far as Ernie Buckley who chipped the onrushing Ardee defence to allow Keith McKiernan to race through and collect the ball for the best score of the match. The touchline conversion was missed by Ernie Buckley, leaving it 26-7. Ardee to their credit fought back as best they could and got in for two consolation tries in the last few minutes, but the day belonged to the Warriors who will play in Division 2b of the Leinster league next season, a huge step forward for this fledgling club and they are relishing the chance to play at the next level up. Division 2b contains teams such as Roscrea Rfc, Ballbriggan Rfc and Athy Rfc so promotion to this level is an enormous achievement. All the squad and coaches Keith Sothern and Rob Davidson should be proud of themselves and what they have achieved. Liam Fitzpatrick, Ernie Buckley, Dusan Vucicevic, John F Seery, Keith Sothern, Jonathan Whatley, Paul Dunican, Eddie Egan (Capt), Daniel Buckley, Cathal Connell, Brian Moore, Mark Coleman, Adam Daly, Conor Flynn and Tony Collins. Subs (All used): Keith McKiernan, Dylan Lynch, Micheal Gillivan, Nigel So and Darren McCormack. Congrats to the Moate CS girls. Brilliant stuff! Midland Warriors to face Ardee in Promotion Playoff as North Meath take the Title.